The approach to St Ives is via the main A30 trunk road. Come off the M5 motorway just after Exeter onto the A30 and head west across Devon. It is approximately a 2 hour drive from there to St Ives. After about 45 minutes driving you will cross the Dunheved Bridge over the River Tamar into Cornwall. If you are running low on petrol it would be a good idea to stop and fill up as soon as you can. There is a stretch of road across Bodmin Moor where there are no services for several miles. Once you pass the services at Kingsley Village (you'll see a large McDonalds sign to the right) you are about 40 minutes drive away. 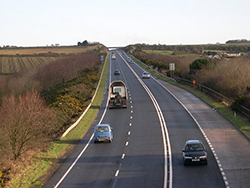 Keep going west on the A30, past turnings for Truro, Redruth and Camborne. 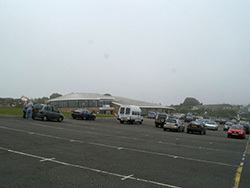 You'll reach a roundabout at Hayle with services, hotels and a retail park. Continue straight across on the A30, up a long hill then down the other side. The final approach is across the Hayle Estuary, as the road levels out. Get into the right hand lane and turn right at the roundabout signposted for town. At the mini roundabout a few yards further on continue straight on if you want to drive into town, or turn right if you want to use the park and ride service (signposted). At the next mini roundabout, again just a few yards further on, rather confusingly, you will see signs to both left and right for the town. By far the easiest route is to turn left and take the "coach road". Drive up the hill and continue onwards as the road wends its way through the countryside. You will eventually reach a T-junction, turn right and drive on through Halsetown. Take care at the sharp left bend opposite the Halsetown Inn. At the next T-Junction turn right down the hill into St Ives. The other route - turning right - will take you through Lelant and Carbis Bay then directly down into St Ives town centre and then the harbour. This is a slightly shorter route but it can get congested at busy times. 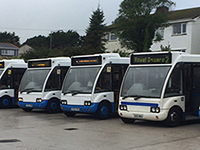 Visit our St Ives Driving and Parking website for lots more information about routes into town. This features interactive route maps and town maps. A video that starts at the edge of Carbis Bay and follows the route down into St Ives then along the harbour - ending at Smeatons Pier. Beautifully filmed in High Definition on a sunny day during St Ives September Festival 2009. Click the play button on the right to view or click the Watch button below to see a larger version in a popup window. By far the easiest place to park is the 1000 space car park at the top of town. 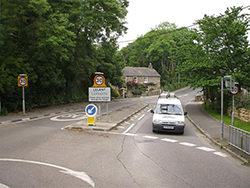 As you drive down the hill, following the directions for the "coach road" route above, you will reach a mini roundabout, turn right, the car park is a short distance further on. There is a shuttle bus service down to the town centre, or you can take the three minute walk down the hill. The other main car park is at Barnoon, turn left at the same roundabout and follow the road until you see Ayr Newsagents on your left. Turn right here following the signs for parking. This is smaller and so at busy times you may have to queue or backtrack. Approach to St Ives on the A30 - Copyright © Tony Atkin and licensed for reuse under this Creative Commons Licence. Turning for St Ives at Lelant - Copyright © Kenneth Allen and licensed for reuse under this Creative Commons Licence. St Ives Cornwall - 1000 Space Car Park - Copyright © David Long and licensed for reuse under this Creative Commons Licence.